Ther 18 noon 36 eveng 20 Clear & when sun was up day fine about 8 morning our red friends were all around in camp with skins to trade Pres Smith told them through the interpreter that we did not trade or do business on the Sabbath, but to come the next day or any other day through the week & we would trade with them, such things as we had to part with but provisions was scarce with us. Peteetneet their leader called his band together & told them what the Pres said 6 recomended them to go & do likewise At about 11 the brethren (& one sister she being the first woman that ever attended meeting in Iron County) assembled in front of Pres G A Smith's waggon for Worship—after singing from the choir & prarre by Bro. Harrison Elder A. Call addressed the assembly on the subject of disobedience—related circumstances connected with himself— 5 the result of disobedience—his remarks were appropriate & in place—Pres Smith then followed & said that not withstanding the union that prevailed in journeying to this place, yet he saw a spirit & disposition by some persons in camp to build up them- selves independent of the common interest of this Mission & in such men he had lost confidence although he was sorry that such was the fact. He said that he was frank to acknowledge that there were men in this camp that were better judges of farming land than he was—But when he saw a man actuated by selfish motives he could not trust in that man's judgment. This Mission was not designed to build up individual alone but the cause of Zion to pave the way for the gathering of the House of Israel by subdueing the land & planting strong posts of defense for the protection of the surrounding settlements, that will hereafter be made & further remarked that many were anxious to know what course would be persued in relation to our settlements & farming operations, would we go into common Joint Stock business or not; to this he answered he did not think that we would be troubled verry much with Joint Stock operations, he wants a couple of Joint Stock grind stones to grind public axes. But that he did not intend to say much at present but wanted the camp to gather at 2 P. M. dismissed at 1/2 past 12 noon by the Pres. At 2 P. M. the Saints assembled in front of the Pres waggon the afternoon Servise was introduced by singing & prayer. Then the Pres addressed the people in substance as follows Brethren we have after a tedious journey arrived safe here at the point of our destination. Though previous to our arrival, many have formed an opinion of the country & its facilities before seeing one foot of it, & the result was many were disappointed, & almost thrown into the French Hysterics, & could not reconcile them selves to take the country & its facilities as they found it, & to alter it to suit their notions of convenience was still a greater task, could they have found ceder on the sides of the mountains & vallies about 30 feet higher than what they actually are & this Bloody soil was turned into a black loam & the burden of the land was here sage grass 6 feet high & so thick that a rabbit dare not enter & small rivers running out of every kanyon alive with fish & above all gold mixed with the soil instead of gravel, it might have met their expectations in some small degree, while others had the building up of the Kingdom in view alone were willing to put up with the country & its disadvantages—& he satisfied & thankful that it is no worse & this is the way we should all feel. I am aware that there is a better farming country on the cottonwood & water enough perhaps to Erigate 6000 acres of land & timber & poles handy—but no site to locate a fort, without being surrounded by thickets on every side where we were exposed as well as our cattle to savage hostilities who could lay in ambush & shoot every man that would attempt to pass and repass to & from his work & could not even go for our cattle without being in danger of having our back stuck full of arrows, to settle at that point was not good policy at present Still within a few years that country will no doubt be settled & be the grand post of farming in this country & I believe that this was the mind & spirit of every man that went with me to explore that country I feel for the interest of this camp as much so as any other man can. I love every man in it, & my only object is to do for the general good & to fill the mission for which I was sent in connection with my brethren & then continued, I have some items of business to lay before you upon which I want the mind of all, 1st. Shall we settle in a compact fort with a carrall in the center for our cattle; when nessary? unanimously agreed that we should 2nd Shall we build public house for public worship, council, Schools & dancing when nessessary, respond, we shall; 3rd What shall the size be (answer let the Pres dictate) again shall we build this house, survey the fort, & make the road into the Kanyons, under our present organization motioned by J. D. Lee seconded by Capt. Whipple that we remain as we are until the public work is completed that has been spoken of Capt. S. Baker objected said that his feelings was, that more labour could be done under direction of Bishops than of capts J. D. Lee sustained his motion said that he was of the opinion that there was public spirit enough in this Mission to stimulate every man with one united exertion to lay hold & accomplish a work so much needed (as the one referred to) & especially when the interest of the whole camp is involved, without changing its present organization. The Capts know their men & their men understand their Capts & from the past, we have every reason to believe that they will do as well under its present regulation as any other. Capt. Whipple followed & sustained the remarks of J D Lee & said he considered now was the best time for this camp to make the road build the house etc.— all are waiting for the location of the field & fort to commence building & fencing & before they can build the road must be made & while they are waiting for this the road & house can be built under the direction of their respective Capts, who can credit every man for what he does, this being done every man is ready to go to work for himself—the road is made & the land is surveyed, & our meeting house is ready for preaching & the dread of our minds. Capt. Call backed up the remarks of the motion, the question then being called for was carried without a desenting vote—it was motioned seconded & carrid that Bishop Tarlton Lewis take 8 men & ascend the Kanyon & cut the logs for the public house. That Lieut. J Lewis detail one man from each co of 10 for a camp guard & drive up the cattle of evenings— That Capt. Wm H Dame surveyor take as many as was nessary—survey the fort, & Capt. Almon L Fulmer (supervisor of roads) with the other Capts & their men locate & make a first rate road up center creek kanyon to the timber The Pres then said that he should call to his assistance Philip P. Lewis & John D Lee both members of the council of fifty & they 3 would select the ground, & locate the fort, at 18 minets to 4 the meeting dissolved by prarey from the Pres. Evening mild Ther between the hours of 8, & 9 o'clock evening the Pres with J. D. Lee (who acompanyed him) was at the surveyors camp fire where he & others, were taking an observation to regulate his compass, returned about 9. Iron Co Mission Center Creek Encampment Tues. Jany 21st 1851 clear light wind south east mild Ther. 16, noon 40 evening 18 About 8 morning Capt. Fulmer started up the kanyon with about men with axes spades, crow bars picks etc. Lieut Jas Lewis mustered the camp guard. Pres Smith P. B. Lewis & J. D. Lee of the Council of Fifty, Wm H. Dame surveyor, E H Groves George Brimhall & Isaac Bernerd,—about 9 morning gathered up their surveying apperatus & went on the ground the committee established the corners of the fort. 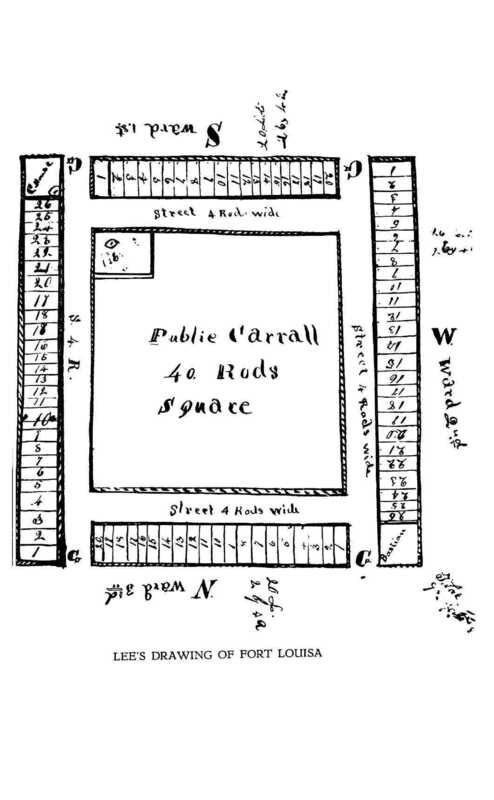 The Fort was laid out 56 rods square, with a square in the center of 40 rods, for a public carrall, with a street 4 rods wide around the square with 4 large gates opening north & south 2 on each line, on the south east corner 4 rods square of ground is reserved for a Council House to be built 45 by 22 feet with recesses one on each side of 12 feet deep forming a bastion on that corner; & on the N. W. corner 4 rods are also reserved for a bastion, & around this square are laid out in lots 2 rods by 4. 26 lots on the 2 E. & W. lines & 2 on the 2 N. and S. lines making 92 lots in all— about 5 P. M. Bishop Lewis returned with his co of 9 men from the kanyon reported all the timber cut & ready to haul for the Public or Council House—also brought a saw stock to camp about 2 feet over (price) which they said was one of the smallest size—the log was a good specimen of timber. Pres G. A. Smith occasionally with the surveying company when in camp reading history. About 10 Philip B. Lewis Capt. Edson Whipple D. A. Miller & Ths Corbitt set out on an exploring excursion to the Little Salt Lake, by order of Pres G. A. Smith. About 3. P. M. the explorers returned brought with them specimens of their discoveries—among which were found collected on the roots of sage brush a white saline substance about 3 inches above the bottom of the lake The substance found on the bottom of the lake appeared to [be] an alkily resembling saluratus. The lake having receded (from some cause not exactly ascertained) about 3 feet from its highest stage. They supposed that there must either be a sink or an outlet, they took from the surface or bottom of the lake a substance resembling slacked lime which they brought to camp as an experiment in making soap (but more particular when the water is tested). The whole surface of the lake was frozen over suffciently strong to bear up a man on horse back, they had nothing to cut the ice & consequently could not [tell] the depth of the water. They reported the lake to be about 8 ms in length & from 2 to 3 ms in width. They also reported a large body of first rate farming & meadow land lying about 5 ms North West of the fort, the soil appeared to be of different formations & heavily coated with grass & around this meadow land a rich lively redish soil appears with a heavy growth of rabbit bush from to 7 feet high. About 3 ms from our location the creek forms three branches & in those forks are from one to 2000 acres of the best quality of farming & meadow land. The Pres. & camp was highly pleased with the discovery. An ox belonging to I H. Johnson was reported dead since our arrival & that William Mitchell sold a cow that was on the lift to the Indians for 2 buck skins, then [the] Indians butchered her. Soon had her devoured like so many wolves, weather fine this evening. All is well in camp. At 8 o'clock the Pres arround in camp from one camp fire to another as usual consulting the feelings of the brethren on different subjects & was scarcely ever known to leave without first reminding in some way or other of the object of their mission. About noon our Red Friends left our bourders. 4 1/2 miles above camp, the cave is about 120 feet long & about 40 wide & about 10 feet deep—in it is found a good quality of white lime stone which has been tested, & found first rate. About 4. p.m. Daniel Hendrix & Saml Bringhurst explorers reported large quantities of pine timber (sutable for saw & buildings) in several smawl kanyons west of Center Creek which makes up the mountains south, which is also covered with rich bunch grass now green 3 inches high but saw no prospect of a road to the timber. Last evening the Pres had the camp collected togather & dealt out the lots to them as long as any man wanted one all taken but 2 lots on the east line there being no demand for them the Pres said he would take them. Whitney Blacksmith for 3 days past has been blacksmithing for public purposes today he was detailed as one of the camp guard and done some smithing. Bro. Wolf another one of the guard mended Pres G. A. Smiths book J. D. Lee writing camp journal At 10 Pres G. A. Smith in co with capt O. B. Adams rode up center creek kanyon to look out a mill site & see how the hands come on with the road About 4 p. m. the Pres returned, stood his ride much better than he did on yesterday, reported a good road so far as they had gone, which was about 4 ms About 30 minets to 5 p. m. the supervisor returned with the road company & reported the road finished up to the timber— [blank] were consumed in making the road. About dark the men in camp colected in front of Pres Smith's quarters, after they had set his family waggon box on the ground, from off the wheels, he mounted a wood pile & spoke a few words to the brethren said that they had done first rate this week, that within 4 days this camp had almost accomplished a merricle the road that they had made for a kanyon road was the best that he ever saw & had it not been for the frost less than 1/2 the labor would have made the road. The timbers for the Council House were all cut the fort laid out & each man [had] his lot & the Liberty Pole we can raise on the morrow—besides doing camp duty hearding cattle erecting grind stones some blacksmithing shoe making exploring camp writing etc. all within 5 days. I think we have done enough this week & tomorrow I move we send out a committee of the whole that want to go to look out the land for a Big Field—& that Wm H Dame be the chairman of that committee & when we find the right place then we will all unite on it, if we act with an eye to the building of Zion. I will stay with the invalids 8 keep camp while the farmers look at the land & on Monday we will be ready for the kanyon. Clear still mild weather Ther. m 24 n 52 e 30 The men in camp kept the public grindstone rolling all day sharpening up the axes for a big job next week About 10 morning about 40 men started out in a committee to look for the best location for a big field to accomodate the whole mission. Rode from 10 to 15 ms returned about 3 p. m. highly gratified with the prospect for farming. Pres G. A. Smith reading & studying. About 25 minets to 5 p. m. the Liberty Pole was raised on the south east corner of the public carrall Pres G. A. Smith presant at its erection & helped with his own hands. Evening fine This day the Pres. had a bowery made in front of his waggon of red ceder boughs to break off the wind. The city plat the ground on which the Council House was to be built 8 the Liberty Pole stand was dedicated & consecrated to the God of Iseral at the laying of the foundation. ploughs & strong teams & could manage the wire grass land to a good advantage, to such it would be proffetable but a great many have poor ploughs & weak teams & some no ploughs at all—& what is still worse than all they lack experience, to that class it would be very unprofitable to engage in the tough hard sod this present year, but could we so manage it as to unite our interests & have a portion of both kinds of soil to cultivate this present season it certainly would better accommodate the whole & would be in my opinion the best policy. Iron Co Mission at Center Creek Encamped Mond. Jany. 27th 1851. Morning clear & mild by arrangement previous made the 2nd 50 got up their teams & by 9 o'clock were off to the kanyon for the timber of the Council House the balance of the camp were numbered off into companies suitable to carry on the various branches of the public works a co. of about 30 men under the direction of [blank] continued hewing and raising the Council House Some 4 others were employed in digging a well, some hauling stone guarding blacksmithing & the clerk & the Pres at their head writing & drafting among which was a letter to Wm. I. Appleby clerk of the Supreme Court, committing to his charge the bonds with approved security given him by the associate Justice & county clerk of Iron co. One to Dr. Williard Richards for the Deseret News, one to Pres. B. Young containing general information of the affairs of the Iron County Mission, in it was sent a plat or diagram of the fort & Council House (drawn by J. D. Lee) One to Franklin D Richards England, one to the Postmaster general at the city of Washington, one to Professor Carrington requesting to suggest the propriety of sending one to Dr. J. M. Bernhisel and 4 letters to his family. Evening rather cool wind west. By order of Pres G. A. Smith the road was measured up the kanyon & distances established mile posts & 1/2 mile posts were set up. Iron Co Mission Encamped at Center Creek Wed. Jany. 29th 1851. Morning clear but rather cool. This morning a call was made from both companies of 50's for teams to continue hauling the timber for the public. About 20 teams were raised only,& 8 about 20 men to work roads, & about 30 to work on the public buildings 4 at the well the guard consists of 18 men. About 7 evening Ammon the Indian brother of Walker (the hawk of the mountains so called) invited the Pres & J D Lee to pay him a visit the Pres. took with him T. Wheeler the interpreter & they 3 went & spent an hour in his tent or lodge. They had buffaloo robes spread down to sit on. His braves were all seated around in a circle the pipe was handed round & smoked during the chat an evidence of peace. When leaving he gave the Pres a deer skin in return the Pres gave him a silk handkerchief. Light clouds warm to day a general rally was made on the Council House scouring hewing & raising hauling rocks& underpinning all at the same time the surveyor with the Pres trace a line E & W, No & South the better to judge the amount of land nessary to be taken into the big or common field, previous to running the lines the Pres. confered with J D Lee on the subject who was of the same mind with reference to the location of the field that it was not good policy to throw the farming interest of the camp to far from the fort, lest our enemies should come in 8 use us up with our own guns when we were off in the field at work. About 3 p. m. a light shower of rain from the west & continued at short intervals all the night about the time the rain (which was acompanied with wind though not high) the work on the house stopped for the want of timber. The building was & rounds high when the hands quit work, the Pres was occasionally among the hands, engaged in various branches of the public. agreed upon, then continued he there will be a general rush for the timber 8 I do not want any particular restrictions or liberty given to any man but to do right that is liberty enough for any man, to slash down any great quantity of timber would not be very prudent nor run over it & tangle it about would not produce good feelings. Within 1/2 hour after the liberty was granted the road was lined with chopers. The surveyor commenced surveying the 5 acre lots to accommodate the whole camp with a small piece of land near by for vines potatoes & garden stuff. About 10, Brethren from California left camp for Salt Lake City Pres G. A. Smith this morning wrote a letter to Pres B. Young. Soon after this Co. started the Pres. with his own hands held the plough to make the first furrow that ever [has] been made in Iron Co to our knowledge, & sowed some wheat. 4 o'clock p. m. would have astonished any set of men (but Mormons) to have seen the havock that had been made within 6 hours time only. There must have been at least 1500 house logs & as many poles. At 6 evening growing rather cold wind S. W. the camp assembled by camp fire in the center of the carrall. The Pres addressed them spoke of their opperations in the kanyon advised to haul their logs out togather in some place handy to load & out of anothers way 8 not to venture without their fire arms—that it was better to carry them 20 years & have no use for them than to need them once & not have them. He made them acquainted with the arrangement of the day & called for names of such as wanted 5 acres lot. About 6 persons applied—after which 10s will be run off & after some remarks with reference to fensing a committee of 3 were appointed to look out the best ground to take out a branch of the creek to guard against the crickets & at the same time make the creek form a line of the fence on motion Bishop Robinson Bishop Call & Bishop Miller formed that committee which was known as the Wire Grass Committee. Iron Co. Mission Encamped at Center Creek Sat Feb. 1st. 1851. Clear & mild though froze hard through the night. Today a general turn out for the kanyon insomuch that the Pres. a few invalides & the women were all that was left to guard the camp. In the evening the kanyon was lined with loaded wagons & teams for 5 ms hauling house logs & fencing. All is reported well in camp save one man a Bro. Cartwright who unluckily cut one of his middle toes off & the one on each side nearly off with his ax. Morning fine sun warm About 10 morning the trumpet was sounded as signal for a public worship—the assembly was convened in front of Bishop J. L. Robbinson's waggons—a table was set in front of the place occupied by the speaker The Bishops were invited to take their seats near the table on which was placed the bread & water for the Sacrament. The servises of the morning were introduced by singing from the American choir & prayre by Elder Moss. The Pres then read a passage from the Doctrine & Covenants & one from the book of Mormon, both treating upon the nessary preparations for partaking of the Sacrament, he then made from the above passages, some brief striking & appropriate remarks upon the duties of man the principle of graduation & danger of being led astray into darkness & total destruction etc. Liberty was then given for any others to speak that felt wrought upon—whereupon Elder Groves Baker & Mitchill each delivered a short exhortation. The Pres then called for a hymn from the American choir. He then broke the bread with his own hands—asked a blessing upon it, gave it to Bishop Robinson & Lewis who gave to the multitude to eat & drink in commemmoration of the Body that was broken & Blood that was shed for the sins of the world, while the bread & wine (or substitute was passing Elder J. D. Lee occupied the time in speaking, said that he did not profess to be exceedingly religious, but that he was a man clothed upon with mortality & full of foiables & imperfections & was oftimes excited & thrown off his guard & while in the moment of passion he was liable unguardedly to speak to the injury of his brethren's feelings, which after mature deliberation of a candid & sober reflection, the manifestation of his own folly appeared as unbecoming to him as it could possibly to others & but seldom passed without leaving the sting of deeper mortification upon his own feelings & that he almost regretted that he was thus constituted & that his desire to do right & build up the kingdom was his constant prayre & continual aim & that he loved this cause & his Brethren & that he regarded & respected their feelings & wanted to be one with them in all things & should he at any time have injured their feelings he wanted their forgiveness. Meeting then adjourned till 2 p. m. giving each time to get refreshments agreeable to adjournment the people came togather —Meeting opened by singing from the American choir and prayre by Elder Miller. The Pres. addressed the brethren said that he wanted to lay some items of business before meeting & hear their feelings on the subject, one was the propriety of our moving on or near our lots as early as Sat. next. After some remarks voted to move on Sat. next, also voted that on Wed. or Thurs. next that a dam should be thrown across Center Creek & water taken out for the use of the camp. Another item is to ascertain the amount of land wanted by each man to cultivate this present season both in the wire grass 8 on the uplands. P. S. the Pres in his remarks said when at Fort Peteetneete he examined the teams & according to the best calculation that he could then make his judgment was that more than 50 head that would have to be left by the way, but to our astonishment a half dozen would cover the whole & entire loss, & some 2 or 3 have died since our arrival here. Iron Co Mission Encamped at Center Creek South Side Mond. Feb. 3rd 1851. Clear & fine This morning by order of Capt. A. Call the cattle were drove up in mass by those who wanted teams to work. The teams having been selected the road was ligned to the kanyon. The Pres was ploughing & sowing wheat. Ammon the brother of Walker the Indian Chief called by the Mexicans of California the Hawk of the mountains assisted him to plough said that he wanted to farm & live like the Mormons. The Pres proffered to give him seed team & plough to farm to which at first he seemed highly delighted but the heat of the sun & fatigue of labor soon made him tell a different story, said Ammon to lazy to work like the Mormons, Ammon hunt kill deer, get buck skins swap to Mormons. About candle light the camp was called togather in the center of the carrall arround a camp fire by the usual signal of the horn. The Pres laid before them the report of the committee with reference to the prospect of fencing the big field. Bishop Call Miller & Robbinson (committee) reported that they had examined the creek & were of the opinion that with little labour say a pole or two along in some places & in other places dig down the banks the creek would form a fence sufficient to turn the cattle a great portion of the creek was already impassiable or nearly so—the banks being steep. They had also looked out the route on which the public sect or water ditch was to be carried & was decidedly of the opinion that the fall & nature of the land, by turning in a stream of water sufficient that within a short time a ditch or trench would be cut by the current sufficiently deep to make a considerable portion of the East line of fense this channel to run directly north & empty into the lake. The south line alone would be to fense with pickets or poles the distance of about 100 rods & to make the fense (or rather the west line) which is the creek secure so as to prevent the cattle from crossing unless through a gate or bars & keep the cattle all togather on that side the crops can be preserved till time can be had to secure it by a good substantial fense. They also reported the sod on the wire grass land to be tough & hard to break. P. S. by running the east line of fense to the lake directly north would include several thousand acres of land more than what could be tilled this present season & that too with near the same amount of fense as to enclose less. On motion the report of the committee was accepted & their views of fensing adopted. Iron Co Mission at Louisa Deseret. Sund. Feb. 9th 1851. Clear fine & warm since the 3rd inst. Thermometer ranging from 24 to 48 degs above Zero. A minute account of passing events connected with the mission during the interval between date 3 & 9 is not here in recorded. The most prominent features of the times above are noticed from the fact, the general clerk or historian of the Mission having been absent during the week in the kanyon preparing logs for house to shelter his family. On Teus. Evening candle light, (Feb. 4th) the camp was called togather by the Pres. suposing the house log fever had in a measure abated. The Pres. expressed his desire to have them remove on their lots as soon as the 5th This request was in part only complied with a portion of the camp being in the kanyon & did not return in time. However all waggons were removed but about half a doz. About sunset on the evening of the 5th a wolf came into the camp while a man & his wife were in the act of catching their chickens. He wished no doubt to share with them ran up within a rod of the woman before he was discovered—when Bro. E. Brown with his rifle brought him (or it) to the ground. This evening the Pres. & Peter Shirts stood guard over the waggons & families that were left till 1 morning. His orders to detail a double guard for the protection of both camps not having been observed. On Thurs. 6th a dam was thrown across Center Creek & commencement made on the public water ditch under the direction of Bishop or at present Capt. Anson Call. About sunset the Pres. & about 20 brethren turned out & removed J. D. Lee's waggons & families to their lots in the city. J. D. Lee returned from the kanyon in time to assist in moving the last waggon. Frid. the 4th line of the inhabitants of the fort turned out on the public water ditch & some 20 men under the direction of I. N. Goodale E. Brown & Peter Shirts went into the kanyon & commenced cutting & sawing the timber for the mill Pres Smith laid the foundation of a couple of log houses for himself while at the same time Richard Benson was sawing with a pit saw the timber for the gearing of the mill. J. D. Lee sent a hand to help saw the lumber. Sat. 8th the same public opperations were carried on with the exception of the water ditch. The Pres assisted to raise his house. 3rd. on motion G. A. Smith was acknowledge President over the Mission at Louisa & Jas Lewis Clerk of the branches. The Pres then observed that this day the company organization was disolved & that our future opperations would be carried on under the direction of the Bishops in their respective wards & that it would be pleasing to him to have the Bishops all manage the affairs of their respective wards expecially the public work under same form that in case a part of the Bishops should return (which will be probable) those left may take hold & manage their wards without coming in contact with each other's manner of doing business. By request of the Bishops J. D. Lee general clerk furnished each of them with a form—as a guide the better to prepare them for a concentration of action. A copy of which will here after be submitted. The Pres. further said that he should like to have the members of the different quorums organize themselves into a quorum of Elders & that Elder H Groves preside over them. Carried without a dissenting vote & that Henry Lunt be clerk of said quorum carried. At about 1/ past 12 meeting adjourned to 2 p. m. when the Elders quorum were to meet, during the intermission the Pres Bishops & J. D. Lee met in council & deliberated upon the policy of making or rather fensing in a place to keep the milch cows in of nights & other matters of convenience for the mutual interest & benefit of the camp At 2 P. M. the quorum met meeting opened by singing from the American choir and prayre by Elder E. H. Groves. Pres. G. A. Smith then said that he arrose to claim membership in the quorum of Elders. Said that he believed his former course of conduct since a member of this Church entitled him to a seat among them. But previous to taking the names of members some items of business was laid before the meeting & deliberated upon 1st 24 rods square of ground (3 1/2 acres) be picked in with pickets & feet long in the center of the public carrall to put the milch cows & teams in when wanted & should necessity require in case of an invasion the whole stock of the camp could be drove in to said fort or carrall for protection carried. 2nd voted to bridge the water ditches. Another grave subject was laid before the people but no action was taken upon it. 550 acres of wire grass land is applied for in the present intended survey out of 350 or there about & about 1000 acres of up land making 1550 which is certainly more land than is needed for the present season there being only about 550 bushels of seed wheat in camp some oats corn braly & some few bushels seed potatoes etc. The brethren ought to wisely consider that it is not good policy to overcrop ourselves—there is a great deal of work to be done always in the settlement of a new place more than what many are aware off. A small crop well tended is better than double the amount of land run over & half tended but some have applied to me for farms to be run out exclusive from the big field to prevent others from jumping their claims, to this I will answer I have the authority to grant such rights—to any man and I will not till I am authorized to do so by the Pres. Young. A word of advise for the Red Brethren Said that he wanted to be the only man that fed them in camp if any had a mind to set them to work & want [to] feed them that he had no objections, but to indulge them in their laziness is not advisable they have their way of living & let them depend on it, or labour as we do, it would not be amiss for each man to weigh his supplies of provisions lest he may be making way with it faster than what he is aware of. We should be pleased to have some faithful efficient man get up a heard of milch cows a great deal of time is spent in hunting cows, which may be avoided could we get up a heard. The timbers for the mill should be got out this coming week the necessity of a mill is imperiously felt by all at the present. The mill can be put in opperation within 4 weeks time without injuring any man. There are men who are not ready to plough, that might spend a few days on the mill just as well as not. He advised industry, said that idleness was no part of Mormonism, still take things patiently. He requested the Militia to be on parade the following Sat. in the afternoon & to come at once in two weeks at least. Said that if we did not have work enough to do that he would plan some more as Joseph said there was more honor in building up cities than there was in living in them after they were built. He laid out more work in one night than the 12 could do in 2 years. Adjourned by prayre at 4 P. M. evening fine, after the close of the meeting the name of each man & their standing was taken as they became members of the Elders Quorum. Frid. 14th cold About 12 noon Ammon the brother of Walker with two other Indians came to camp staid over night. About 12 noon Sat. 15th Ammon started for Walker encampment, by him Pres Smith sent a plug of tobacco to Walker the Chief as a token of friendship, here Ammon left Tomamp & Nonofasteet two Indians of Walker band with J D Lee requesting him to feed them & made them work—those two Indians had been delegated on a mission to the Great Salt lake by Walker who by some cause or other got it in his head that the Mormons were not his friends & that the Mormons had been at war with the 10 Penny Eutes, but finding us friendly the messengers stopped. Sund. 16th clear—weather more mild—snow on the ground about 3 inches deep. No meeting to day the weather being to uncomfortable to sit in the open air. About 8 o'clock in the evening Bishop Anson Call & Capt. A. L. Fulmer without feelings of enmity toward any man, collected about 40 men with hand spikes to remove a log cabbin on the line of the fort belonging to Sixtus & Nephi Johnston Bros. The Pres having previously instructed the Bishops to see that each man put his house on the line & should any fail to comply with this request the Bishops were to have them shoved on the line. The men gathered around the house the Bishop was sent to invite the owners of the house to the bee, expecting them to join the company with friendly feelings, which they would doubtless would have done had not Jos. Millet a young chap about 18 years of age gone to them before & influenced them to the contrary. They & the lad before mentioned to the surprise of the company came out with guns threated to shoot the first man that touched the building. The gun was taken from Jos Millet by Richard Benson 8 David Brinton J. D. Lee walked up to the Johnson boys & reasoned with them on the subject & explained the object & designs of the co told them that they were among their friends & not their enemies & that no man wished to impose upon them—after moments of reflection the boys were perfectly calm & repented of what they had done though no evil was intended by the co yet the result produced shame & mortification of feeling by all concerned in the affair The Pres who had retired to rest in his waggon some 8 or 10 rods distance from the place where the crowd had collected was aroused by the noise 8 threats of shooting—half dressed run out to the crowd under no small degree of excitement enquireing the cause of the tumult on learning the facts in relation to the affair he was equally mortified though indignant at the whole proceedings, expressed his disapprobation to it & thought another time would have been more proper to have moved the house on the line took the lad by the collar who had threatened to shoot repremanded him severely then threw him on the ground—telling him & others at the same time never to be heard threatening to shoot again. However the better to determine their designs or intentions the charges in the guns were examined & found to be wads only which leave the reader to infer that no deathly design was premeditated. This circumstance though unpleasant taught the company to understand that caution & reflection were the parrents of safety & some times a smawl matter kindleth a great fire. A few nights after the same house was put on the line by request of the Pres. However but few that was in the first Co assisted in the last opperation. Mond. 17th weather cold Tues. 18th but little change Wed. 19th cloudy wind south west About 2 P. M. the brother of Walker came in camp & reported that Walker was on the Muddy the distance of about 40 miles that his men had returned from California with about 100 head of horses & mules that they had a battle with a company of the Mexicans who had foiled them to retake their animals one Spaniard was killed though they succeeded in taking several hundred head of horses from the Indians etc. Brought with him a letter from Walker the Chief, that had been written to him by Pres Young bearing date May 4th 1849—G S L City—requesting him to be friendly etc. The messenger said that Walker wished the big Captain at Louisa to write his feelings on the subject. Evening cold through the night about 2 inches of snow fell. Thurs. Feb. 20th cloudy & snowing rapidly—day blustery about 12 noon the messenger from Walker started for Ammon's Wickeups which was about & or 10 mis east of Louisa evening snow on the ground about 8 inches deep cold Frid. Feb. 21st cold & clear About 10 morning some 10 or 15 Indians of Peteetneet's band passed through the city on their way to their lodges from a hunt. Some of their ponies were packed down with venison & skins. They appeared to be well clothed & in comfortable circumstances they however had not proceeded far till they were met by the chief & the remainder of the band who were removing to Louisa or near by. After a short council the whole they all concluded to encamp on Center Creek & trade off their skins & wait the arrival of Walker & his band. P. S. On Sund. Feb. 9th 1851, about & o'clock in the evening J. D. Lee at his own fire side was bit on the left hand by a dog the bite was severe indeed. The dog sunk his teeth or tusks in 15 places on the hand 8 some went near through which disabled him from doing any kind of labour with that hand for more than 15 days. Sund 23rd. March [February] clear & pleasant at ten morning the Saints assembled in the Pres Carrall or School Room for public worship. Singing from the American Choir & prayre from Elder Wm Mitchell, the Pres then delivered a short lecture on misselinous subjects at 3 P. M. the Elders Quorum met. After singing & prayre Bishop Anson Call was chosen to be the first counsellor to the Pres of the (Elders) Quorum & Bishop Jos. L Robbinson 2nd counsellor. Pres. G. A. Smith then delivered a short address upon the object & design of getting up the Elders Quorum & advised any or all persons should there be any that had difficulties between each other to settle them immediately for in that body of men he wanted union & good feelings as it would likely be the law making department for this city & its surrounding inhabitants as was the City Council of Nauvoo to that place & that items of law upon state & governmental affairs should be debated in this Quorum as a Legislative Body that every Elder by applying his mind to this subject may acquire the nessary information of legislation and governmental affairs etc. Evening pleasant. From Sund. 23 up to Thursday 27th weather growing mild moderately. This evening Ammon the brother of Walker came to camp & reported that Walker & his band was encamped on a stream beyond Cottonwood Creek the distance of about ms from this point—he said that Walker wanted the Pres. (G. A. Smith) to write him a letter in it to express his wish & feelings frankly with reference to his coming & raising corn, wheat etc. with the Mormons, & to send some 2 or more of our men to read the letter & confer with him. Frid. Feb. 28th clear moderate weather about & morning the Pres ordered the following letter to be written & a copy put on file Louisa Iron Co Deseret Frid. Feb. 28th 1851. We received a letter from you by one of your men (Tanterbus) on the 19th instant dated Salt Lake City May 4th 1849, written to you by our first President Brigham Young who sent me here with one hundred waggons, with seed & farming tools we, came here heavy loaded. By March 25th the colonists on Center Creek had surveyed about 1600 acres of farming land and sowed 400 acres into wheat. New arrivals from Great Salt Lake swelled the population until on April 1 there were 360 residents—191 males, 169 females. Brigham Young visited the settlement from May 10 to 16, and thirty men returned with him to Salt Lake City, either to bring back their families or give up the mission. John D. Lee left for Salt Lake City with a party of thirteen on June 4, but soon rejoined the Iron Mission. He left Parowan on January 27, 1852, with a company to explore the Virgin River Valley. On June 12, he began a second exploring trip which took his company to the headwaters of the Sevier and Virgin rivers, down the Virgin, and up Ash Creek toward Cedar Valley. Soon after he settled Fort Harmony on Ash Creek. George A. Smith continued with the Iron Mission until November 2, 1851, when he conducted a survey for the location of an iron manufacturing colony on Coal Creek (present Cedar City). On November 5, 1851, he wrote to the Deseret News: "Yesterday [November 4] a site was surveyed for a fort and stock corral on Coal Creek, 20 miles from Parowan. Today a company has been organized to commence operations immediately in the construction of this new post. They are mostly composed of English, Scotch, and Welsh miners and iron manufacturers. They have been organized into two companies of militia, one a horse and the other foot; and form the second Battalion of Iron County. Matthew Carruthers is the Major. The company are all in fine spirits. They will commence on Monday to put up their corral, after which they will move their families which are remaining here and encamp in their corral until their fort is completed. They have a beautiful situation." Deseret News, November 29, 1851. The Parowan Ward Record notes on November 10: "A company of 35 men, with 11 wagons, from Parowan, under the charge of Henry Lunt, as president, started for Coal Creek to form a settlement, arriving at their destination the 11th and at once beginning their labor on the fort." Having thus launched the final phase of the Iron Mission which he was called to direct, George A. Smith left Iron County 40 on November 6, and arrived in Salt Lake City on the 13th. (The Parowan Ward Record states that he left to attend the Territorial Legislature at Fillmore.) 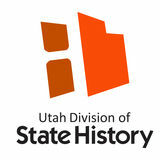 Through his continued contacts with Iron County and Utah's southland he became known as the "Iron Colonel" and father of southern Utah colonies. For full citations please view this article on a desktop.